But, hands down, the score that made me stupid giddy was the bag o' cloth diaper hand-me-downs from our friend, Liz. 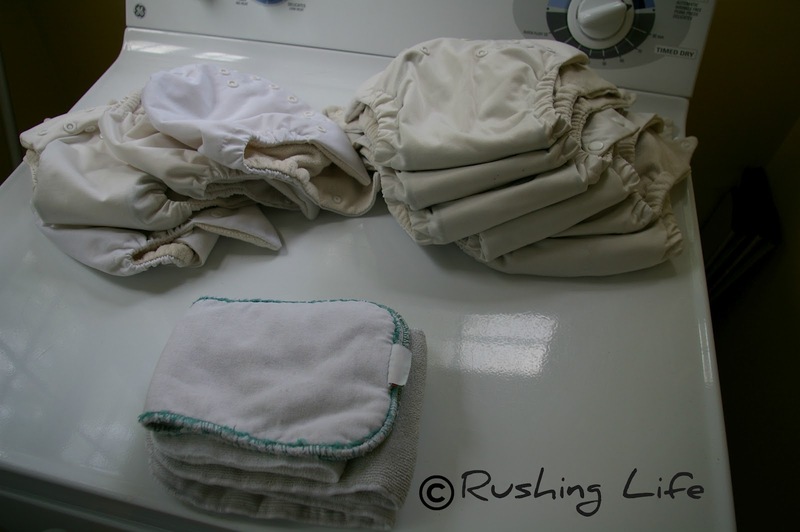 I had mentioned HERE about our preference to cloth diaper, and when Liz found out, she gladly passed along the ones that her littlest had outgrown. This makes me happy for several reasons, but the biggest being that we can have a guilt-free, cost-free, test drive of cloth without any major investment. No, they're not the brand/style/color we would've bought for ourselves, but who cares?!? And if we try them out and it's a bust, then we can at least say we gave it the ol' college try. And if we love it? We'll gladly hop on down to our local hippie baby store and stock up on cute pink and purple ones in the brand/style we think we will like best. Liz informed me that it was time for the diapers to be stripped, and since I know a thing or two about stripping (or do I? ::wink::wink::) I told her I would take care of it. So, on a warm Saturday while Puff mowed the grass, I hunkered down and pressed forward on my Quest for Cloth. 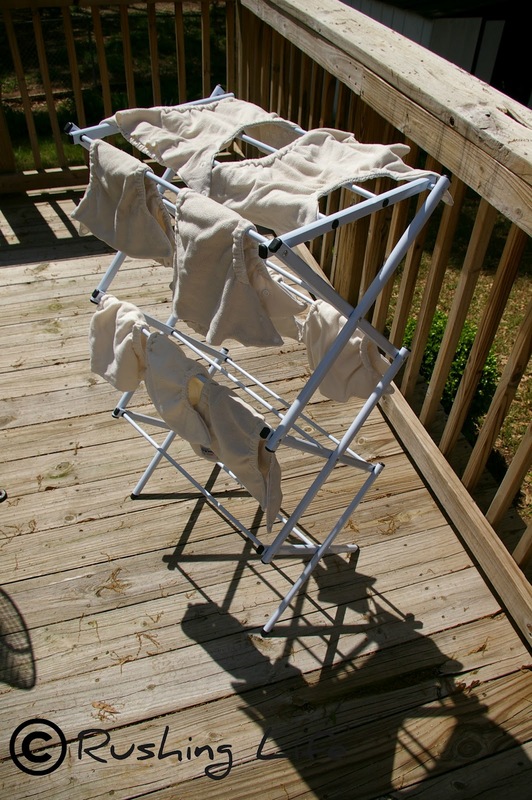 Basically, all I had to do was wash them and then run it through another time with some Dawn dish detergent. I rinsed them again until all the suds were gone from the water. And put them out on a new rack on the deck to dry in the sunshine! Thankfully, this process doesn't have to be done very often, and with the right care, you don't even need to strip them at all.So, now Bimmer has a handful of cloth dipes in her new dresser in her room. And we will be trying out those small sized ones not long after we bring her home from the hospita. I figure we better go ahead and try it out sooner rather than later!